The new WAR-LOK light weight, stainless steel lock designed specifically for Utility 2000R and 3000R trailers and is simple and easy to handle, 2 seconds to install and 2 seconds to remove! The UTL-10, as compared to padlocks and other non-barrier locks, offers superior protection for both the locking pin and the hasp assembly because of the barrier design. Cast from stainless steel, it is designed to resist attacks by standard bolt cutters and a cutting torch. In addition, all lock parts are either brass or stainless steel making the lock corrosion resistant. The UTL-10 is designed to accommodate the use of indicative seals in conjunction with the lock. Since all WAR-LOK products use disc type cylinders, there are up to 390,000 possible combinations, making the lock almost impossible to pick. The locks can be keyed alike, keyed differently, keyed to a master, which offers full key configuration capability. If your customers are currently using WAR-LOK products, (King Pin Locks, Glad Hand Locks, Tractor Air Brake Locks) the UTL-10 can be keyed to those locks enabling the user to maintain single key control. 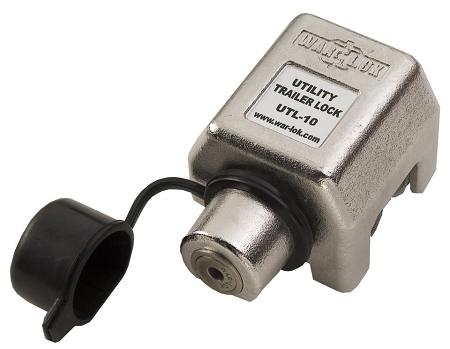 The UTL-10 includes a tether cable for attachment to the lock rods on the trailer, helping avoid misplacement and loss of the lock. Also included, is a rubber boot cap that covers the lock core, preventing foreign objects from entering the lock while driving on the road.